After the death of his father, Zach (Dylan Minette) and his mom Gale (Amy Ryan) leave New York City to start over in the small town of Madison, Delaware, already home to Zach’s quirky aunt Lorraine (Jillian Bell). Not only does the town look like dullsville to the former city kid, but his mom is going to be the new assistant principal at his high school, which isn’t likely to make things easier for the new kid. On the plus side, there’s a cute neighbor girl named Hannah (Odeya Rush), but her dad (Jack Black) seems like a bit of a psycho. In fact, things next door look so intense from Zach’s viewpoint that he suspects possible domestic abuse. Calling the town’s inept cops on his neighbors only backfires, so Zach decides to team up with his only new friend so far, the nerdy Champ (Ryan Lee) to sneak in to the house and see what’s going on for himself. In doing so, the two discover that Hannah’s dad is actually noted juvenile horror author R.L. Stine, and that all of Stine’s original manuscripts are kept locked in a display case. As it turns out, these original editions are magical, and when the kids open one they let loose the monster featured therein, and abominable snowman who chases them and Hannah to an ice rink before Stine shows up and tricks the beastie back into the book. Not surprisingly he’s a bit miffed. Stine soon has bigger problems than the nosy neighbor kid, though. It turns out the snowman wasn’t the only monster set free. Slappy the living dummy got out as well, and he starts setting all the other monsters free as well. Soon the whole town is overrun, and with Slappy having destroyed all the original books the only way to set everything right is for Stine to write a new book with all the creatures in it. Easier said than done when you’re being chased by giant praying mantises, killer garden gnomes, zombies, and a werewolf, to name just a few. By the time the Goosebumps books were a big deal among the pre-teen crowd, I was too old to pay them much mind, having already discovered Poe, Lovecraft, and Steven King. To what degree the film is faithful to Stine’s sensibilities I cannot say, although the fact that the author himself makes a cameo in the film leads me to believe he at least approves of this adaptation. 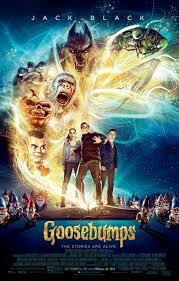 Taken strictly on its own terms, GOOSEBUMPS is a fun, if lightweight thrill ride with more laughs than scares. It’s nothing great, and the fact that the main female character is literally a male fantasy come to life is kind of a shame, but overall it’s an entertaining spook show that kids and parents can watch together, something there isn’t a whole lot of. The direction is straight forward without much flair, the pace is fast, and the performances are fine if not exactly memorable. 2 ½ out of 4 stars.